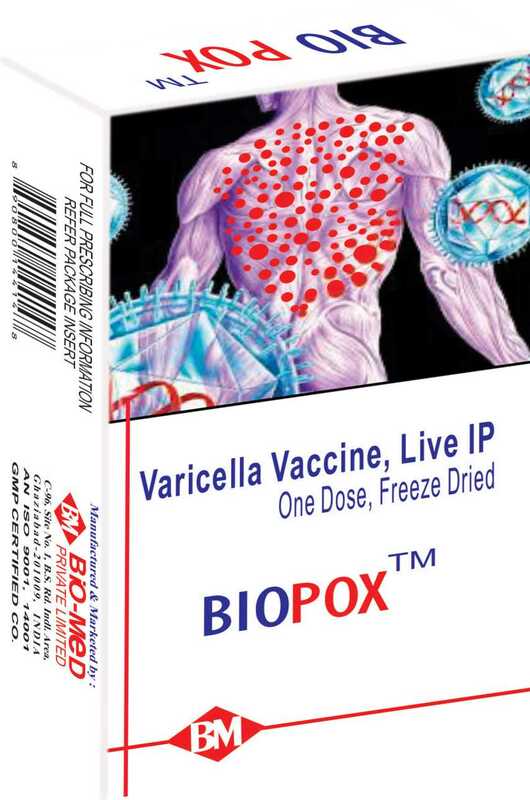 Bio Pox™ is indicated for active immunization against Varicella virus (Chicken Pox) of healthy subjects with no history of Varicella infection and susceptible healthy close contacts. Bio Pox™ meets the specifications of Indian Pharmacopoeia. ≥2000 plaque forming units (PFU) of live attenuated Varicella virus (OKA strain) propagated in MRC-5 human diploid cell culture. Reconstitute Bio Pox™ with the entire content of the vaccine diluent (sterile water for injection I.P.) provided with the vaccine. Shake gently for full reconstitution. Each dose (0.5ml) shall be injected immediately after reconstitution by subcutaneous route. Alcohol or other disinfecting agent must be allowed to evaporate from the site of injection before immunization as they may inactivate the vaccine. Bio Pox™ is recommended for active immunization of healthy subjects of 1 to 12 years of age. IAP (Indian Academy of Pediatrics), recommends 1st dose at 15 months or older, 2nd dose at 4-6 years (can be given 3 months after 1st dose). Catch-up vaccination in children, below 13 years – 2 doses 3 months apart, 13 years or more – 2 doses at 4-8 weeks apart. As per WHO position paper on varicella vaccine, two doses induce higher effectiveness and should therefore be recommended in countries where the programmatic goal is, in addition to decreasing mortality and severe morbidity, to further reduce the number of cases and outbreaks. Vaccination is contra-indicated during pregnancy and pregnancy should be delayed for 4 weeks after vaccination. Termination of pregnancy is not indicated if vaccination was carried out inadvertently during pregnancy. Ongoing acute or chronic illness like fever, severe infection, persistent diarrhoea, vomiting e.t.c. Immuno deficient status/immuno suppressive therapy. There is no data regarding use in nursing women. Reaction to vaccination generally consists of localized injection site reaction (pain, swelling, redness) and systemic reaction (fever, skin rash, headache, fatigue, vomiting, cough) which are generally relieved spontaneously after one or two days. Interspersed rash or blebs may appear to few recipients probably within two weeks after vaccination. No special treatment is necessary. Symptomatic treatment may be helpful in case of need. As with any vaccine, there is a possibility that large scale use of the vaccine could reveal adverse reactions not observed in clinical trial. Store between +2° to +8°C and protect from light. The shelf life of the vaccine is 2 years, if stored at recommended storage conditions. The lyophilized vaccine is not affected by freezing, stability is even better at lower temperatures. Single dose freeze dried vaccine, vaccine diluent (sterile water for injection I.P.) and disposable syringe as combipack. Bio Pox™ was found to be safe and immunogenic in children against VZV infection. Indian Academy of Pediatrics (IAP) Recommended Immunization Schedule for Children Aged 0 through 18 years – India, 2016 and updates on Immunization. Varicella and herpes zoster vaccines : WHO position paper weekly epidemiological record, No. 25, 2014, 89, 265-288. Phase-I, open, unicentric clinical trial for evaluation of safety of varicella vaccine, Live (I.P.) – Sharma et. al. (2014) Biotechnology International 7 (1) : 26-34. Safety and immunogenicity of Bio-Pox™, a live varicella vaccine (OKA Strain) in Indian Children: A comparative multicentric, randomized phase II/III clinical trial – Dubey et. al. Human vaccines & Immuno therapeutics 2017, Vol 13, No. 9, 2032-2037.